One of the hardest parts of a vacation, if not the hardest, is coming home. The excitement’s over — now it’s back to work. But it’s even worse if you don’t know how to end your vacation. The secret to a satisfying vacation finale is simple. Don’t just let it happen. Anticipate it, give yourself a little time to decompress, and always keep a positive attitude. No, that’s not me being all woo-woo. I’ll tell you how to pull it off. Our house in Cape Meares in coastal Oregon. We didn’t want to leave. If you’re like me, you spend most of your trip in denial. The end will not come, you tell yourself. “I still have five days,” you say. Then, “I still have four days.” As the end approaches, you stop the countdown timer and decide to live in the moment. Then the end comes. It always does. When a trip is good — I mean really good — the denial is so much stronger. You’re in a perfect place, like I was last summer when we visited Cape Meares, Ore. We stayed in a ’70s A-frame near the beach. After an exceptionally difficult few weeks, we had finally found a place where we could unwind. The stress abated like the tide running out of Tillamook Bay on a full moon night. My kids and I took long walks along the beach. We visited the java booths of Tillamook, sampling cookies and sipping fruit smoothies. And, of course, there was the ice cream for which this part of Oregon is world-famous. Every day was just right. And it ended. I waited until the morning of our departure to let it register. It was over. That felt terrible. You know the Stages of Grief? I had my very own Stages of Vacation End. Denial, confusion, depression. My middle son asked me what was wrong as we drove south, on a winding two-lane road framed by impossibly green trees and cliffs plunging into the Pacific. He never asks that question. “I don’t know,” I told him. I honestly didn’t. The trip was over and I felt lousy. That’s all I knew. 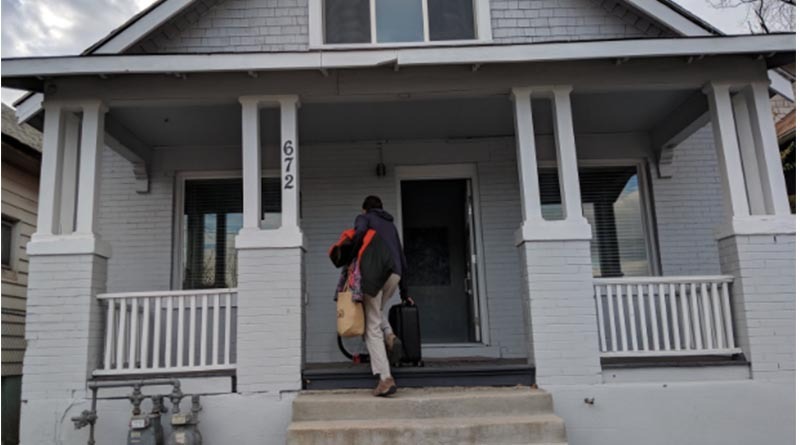 Aren Elliott moves into an Airbnb rental in Salt Lake City. I’m no psychologist, but I’ve had so many trip endings that I’ve lost count. So take it from me, you need to anticipate the end and know what you’re going to do about it. No surprises, cliffhangers, or abrupt endings. That could negate all the positive energy of the last few days, and do you really want that? Anticipate the end. That’s right, keep an eye on your calendar and know that no matter how much fun you’re having, it’ll be over soon. Have an “on the last day” party. The end should be a beautiful thing that you look forward to. Well, as much as possible. Keep something special for that last day — a trip to a favorite restaurant, a walk to the lighthouse, a trip to the ice cream factory. Build an extra day into your vacation to decompress. When you come home, don’t head back to work immediately. Instead, set aside an extra day where you can slowly reacclimate to your old life. Set your bar for reentry low. How low? Well, if you’re married to a type “A” person or have type “A” kids, then you know that coming home means hitting the ground running. I would urge you to resist the urge to paint the house, re-landscape your front yard, or remodel the kitchen. Sure, you’ll come home with a bag of dirty laundry, but you can wait until tomorrow morning to get to it. Just chill, for now. Plan another trip while you’re coming home. As you check out of your hotel or vacation rental, you can say, “Don’t worry kids, we’ll be back.” But nothing underscores it quite like making a reservation for the same time next year. You can do that on your way home. It dampens the blow of returning to your old life. Oh, and there’s one more solution for the problem of how to end your vacation. You can just keep going. That’s what my family did more than eight years ago, joining the thousands of global nomads without a permanent home. You’ll never have to worry about your vacation ending because you’ll always be on the road. That’ll fix it, but it also creates a whole set of new problems. No one said this would be easy. 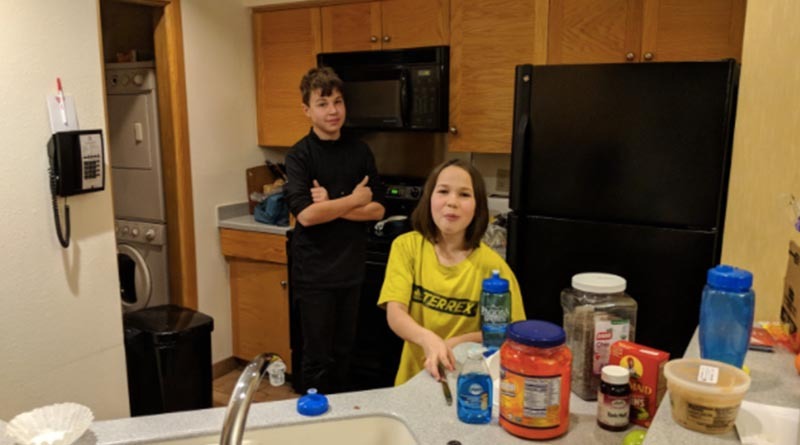 Iden and Erysse at a rental condo in Durango, Colo. We’re homeless by choice, which is perhaps a more radical solution to the problem of bad vacation endings.